Mountainous landscape near Khinalug in Azerbaijan. 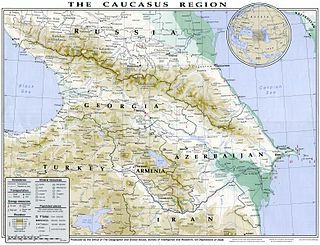 A 1994 map of the Caucasus region, including the locations of valuable resources shared by the many states in the area: alunite, gold, chromium, copper, iron ore, mercury, manganese, molybdenum, lead, tungsten, zinc, oil, natural gas, and coal. Caucasus nai to Caucas, Europe aur Asia ke biich me ek jagha hae. Ii panna ke 19 August 2014, ke 22:25 baje, pichhla time badla gais rahaa.